The evening was uneventful until they got to Shady Rest and ran into a mixed group of vampires and demons working on some sort of ritual. Suddenly, Buffy and Spike were in the midst of a melee, while George and Nigel pushed Lydia behind them, using crosses and crossbows to ward off the occasional stray vampire that thought the humans looked like easier prey. While the watchers had been impressed by what they saw when Spike and Buffy were sparring with each other, watching them working together in perfect synchronicity to clear out a group of demons and their vampire guards was an eye-opening experience. Watching them do it with such joy and abandon was more than a little disturbing. As the last demon fell to the ground and began to dissolve, Buffy and Spike exchanged high fives, barely remembering at the last second that a congratulatory kiss was not a good idea. They shared rueful smiles before turning back in time to see George drive a stake through a vampire’s chest with complete confidence and professionalism. Lydia seemed surprisingly unruffled by the violence she’d just witnessed, obviously having complete confidence in her guardians, even as she ignored them to gaze at Spike with worshipful eyes. While he preened, Buffy snorted and turned to George and Nigel, who’d managed to keep Lydia perfectly safe from any group members that thought the humans were standing between them and escape from the deadly couple decimating their companions. “Not your first rodeo, huh?”she said with admiration in her voice. “Which has been carrying you and yours around for several days, Summers”he growled. “Uh…you aren’t going to leave us here, are you?”Lydia looked around the dark graveyard. “Oh, no. We’ll walk you back to your hotel and then we’ll go get the car. Which one is it?”Buffy strode toward the gate without looking back. Spike shrugged and stretched his legs to stay even as the humans jogged to catch up. After leaving Lydia and her friends at the hotel, Buffy and Spike hastened to the Magic Box to pick up his car. The shop was locked up and dark, so Buffy assumed Giles had taken Dawn home and that they could safely leave. Spike pulled into the driveway behind Joyce’s SUV and shut off the engine. “Home again, home again,”he said, reaching across the seat to run his fingers through her hair. Buffy leaned into his touch, but shook her head when he tried to pull her closer. “But I’ll be leaving in the same condition I’m in now?”He put her hand on the bulge along his leg. “You are such a pig!”In spite of her words, she gave him a squeeze before reaching for the door handle. “If that was meant to be romantic or flattering, it didn’t quite make it. Just so you know…”She climbed out of the car and walked around to the driver’s side, offering her mouth for a goodnight kiss. “I’ll work on the romantic and flattering,”he murmured against her lips as he deepened the kiss. Buffy woke up to find her mother sitting in the kitchen and having a cup of coffee. “Oh yeah. She practically slobbered all over him. He’ll have her wrapped around his finger by the time she leaves. Which, mission accomplished, I guess if he does. As long as he’s got somebody on his side over there, Giles thinks it will help if and when they—”Buffy stopped, not sure what her mother knew about Spike’s chip. As usual, mom’s intuition was all Joyce needed. Joyce just smiled and sipped her coffee. Finally accepting her mother’s assurances that she was going to be just fine and would not do anything more strenuous than carry her coffee cup into the living room, Buffy left the house to check in with her advisor at Sunnydale U. She was pretty sure the semester was a lost cause. And possibly the whole year. She was still muttering when she stopped in to the Magic Box to check on the status of the Council visitors. She was surprised to find Nigel and George sitting at table reading a newspaper. A glance toward the training room told her why. 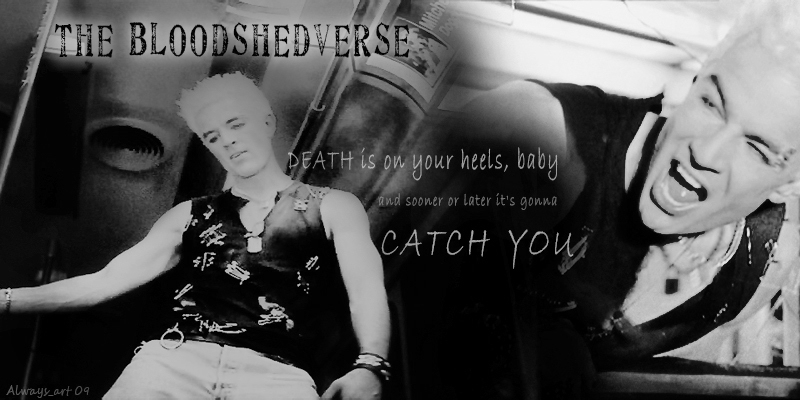 Lydia sat on a chair, legs crossed and notepad on her lap as she stared up at Spike with rapt attention. His attention, on the other hand, which had been focused on whatever story he was telling her, shifted immediately to the doorway and Buffy. Lydia’s expression lost its happy enthusiasm and became one of forced welcome as she saw what had drawn his attention away from her. “Doin’my best, Slayer.”He refused to meet her gaze. “Define ‘somewhat longer’,”Buffy demanded, looking back and forth between Giles and Nigel. They both looked uncomfortable, but neither one spoke. At last, George spoke up. “Lydia–Miss Chalmers will tell us when she is ready to leave. This is quite an opportunity for her. Very rarely does a watcher have an opportunity to meet an old vampire in person, let alone be permitted to interview him.” He finished as if reciting from memory something Lydia had clearly told him. As he finished speaking, Spike and Lydia emerged from the training room. He was grinning and she was flushed and appeared flustered. Again, her happy expression faded when Spike went directly to Buffy and pulled her to the back of the shop for a private conversation. “I’m not jealous,”she muttered, for lack of anything else to argue against. Buffy sighed and shook her head. “Okay, that was jealous girlfriend talking. I’m sorry. You’re right. We told you to be nice to her and make her like you…. I just didn’t know she was going to be so…so…”She waved her hands around, helpless to know what to call someone who was not obviously attractive only because of the way she dressed. Buffy cocked her head at him, her fake pout gone. She stared at him without answering, then just shook her head. “You might be a good flirt, but you know absolutely nothing about women.”With that cryptic response, she walked back to the front of the store where she eyed Lydia in a way that had George stepping up beside her. Buffy shrugged and went to sit down. Spike’s snarled “Over my dusty body”brought everyone’s attention to him, with both Lydia and Nigel narrowing their eyes at him. George, on the other hand, wore just a trace of a smile –one he immediately dropped when Spike caught his eye. They exchanged a long look, then short nods as everyone else frowned at their silent communication. While everyone gaped at him, he turned to go down the stairs. “It’ll take me about fifteen minutes to get back to my crypt from here. I’ll leave the door open.” He vanished down the stairs, leaving all the humans staring after him.